Consider the skills that each scientist participating in the NASA GRC, PineScie Consulting, Vantage Partners and Global Energy Corporation LENR energy group effort brings to the table (NASA GRC/PineScie/Vantage/GEC LENR). A preponderance are engineers specializing in turbo-machinery or aspects of rocketry for space and aeronautics. This leads one to believe they are primarily involved in applied engineering of LENR energy for Non-Radioactive Nuclear Flight (NRNF). First let’s touch on a quick review of the Global Energy Corporation (chapter 1) and take a look at a NASA PineScie purchase and a recent NASA grant awarded to PineScie Consulting. PineScie and NASA have two contract items worth reviewing in detail. The first one, a purchase from 2008, is all about electro-magnetic control of plasma charged lunar dust under the influence of streaming solar energetic particles; which becomes a platform for theoretical modeling and construction of LENR energy devices. The second is a grant at the GRC Advanced Energy Conversion project. Experts knowledgable about various LENR theories and well versed in contemporary LENR research may understand how the ‘Scientific Analysis of Solar Wind Plasma Charged Dust on the Moon’ furthers our understanding and control of the nuclear reactive environments of LENR. For others, the fact that NASA views such analysis, modeling and control as essential to the AEC project would seem to prove the point. Further reading strengthens this supposition. The DOD SPAWAR/JWK LENR energy group and the NASA GRC/PineScie/Vantage LENR energy group now collaborate at NASA GRC on the Advanced Energy Conversion (NASA GRC AEC) project. These groups have been working together since 2015, most likely earlier. They have published two LENR research papers and a LENR energy technology patent. From these three documents is gleaned a working list of the lead researchers, authors and inventors from which the following skill set is compiled. This compilation is preceded by a presentation of the NASA PineScie purchase and subsequent NASA GRC AEC contract award. The ‘Skill Set of Some Scientists at the NASA GRC AEC Project’ is then followed by ‘Further Reading and Review’ wherein there is information concerning development of the NASA SUGAR Project Phase III, the NEAT testbed at GRC, and LENR aircraft turbo machinery performance. ED addendum - Monday April 23 - Following ‘Further Reading and Review’ you will find new information regarding a United States Naval Institute / Leidos Corporation essay contest awarding an LENR author second place. You will also see fresh information about recent GEC and NASA GRC contracts, from January 2018, which I have inserted (*) into the appropriate part of the review. Researching and processing information as it comes in and as time allows. 1 - NASA/GRC has a requirement for a specialized scientific analysis related to the development of a theory including an estimation of certain properties of Solar Wind Plasma Charged Dust on the Moon. The length of the study is nine months. 2 - NASA/GRC intends to purchase the items from PineSci Consulting and its principal Dr. Vladimir Pines. Dr. Pines has recently developed the first lunar specific aspects of solar wind plasma, as well as worked on the fundamentals of dusty plasma transport and control. Dr. Pines has published in the fields of statistical physics, phase transitions, and plasma physics. Two of his most recent and relevant studies were published in the Journal of Advances in Space Research for the past two years. The analysis required will enable NASA to understand charged dust behavior on the moon, a key issue identified by NASA as potential mission hazard. 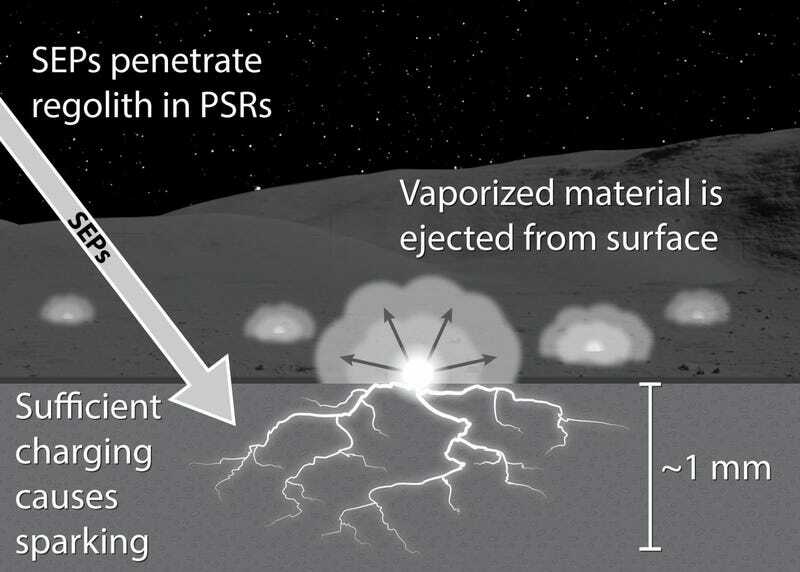 3 - Dr. Pines has also developed the first micro-macro description of the microphysics of cloud formation - a task uniquely suitable for the conduct of the present technical program of Lunar Dust Mitigation. Since Dr. Pines is the sole developer of the theory that underlies the techniques of statistical description of such micro-macro processes, he is the only suitable vendor to develop the required set of equations and models for this Lunar Dust Mitigation Project. 4 - The Government does not intend to acquire a commercial item using FAR Part 12. See Note 26. 5 - Interested organizations may submit their capabilities and qualifications to perform the effort in writing to the identified point of contact not later than 4:30 p.m. local time on January 8, 2010. Such capabilities/qualifications will be evaluated solely for the purpose of determining whether or not to conduct this procurement on a competitive basis. A determination by the Government not to compete this proposed effort on a full and open competition basis, based upon responses to this notice, is solely within the discretion of the government. 6 - Oral communications are not acceptable in response to this notice. Intro: The Advanced Energy Conversion (AEC) project at NASA Glenn Research Center investigates advanced materials concepts for heat production in various materials <redacted>. The AEC project is seeking theoretical and computational support for the project. This procurement aims at conducting performance-based tasks to assist NASA. 1 - JOFOC: This document is a justification for other than full and open competition prepared by the NASA Glenn Research Center. 2 - The nature and/or description of the action being approved: This justification provides the rationale for contracting by other than full and open competition for the acquisition of services to conduct theoretical development of advanced theoretical physics models to assist the Advanced Energy Conversion (AEC) project. These services are research and development (R&D) in nature, and are sought from a vendor who provided similar work for the Government under a prior procurement. That work resulted in a highly sensitive and proprietary intellectual property that has been a subject of multiple patent applications filed and jointly owned by the Government. 3 - Description of the supplies or services required, include an estimated value: I recommend that GRC negotiate only with PineSci Consulting for development of highly advanced theoretical models <redacted>. The services required are used by the AEC researchers in design of advanced energy conversion processes and devices, and assist in collaborations with other Government agencies, including the Department of Defense. The services sought are for a base period of one year, with two option years. The total value of this procurement is $480,000.00. 4 - Statutory authority permitting other than full and open competition: 10 U.S.C. 230(c), only one responsible source and no other services will satisfy Agency requirements. FAR 6.302-1, Only One Responsible Source and No Other Supplies or Services Will Satisfy Agency Requirements. 5- A demonstration that the proposed contractor’s unique qualifications or the nature of the acquisition requires use of the authority cited: The contractor has previously provided similar services to the AEC project under a separate procurement to end on 07/09/2017. The contractor is a theoretical and computational physicist with over 40 years of experience in theoretical work of direct relevance to the AEC project <redacted>. The contractor has successfully developed breakthrough theoretical understanding of key processes involved which are presently guiding the development of experimental work in the AEC project. These models and understanding have been incorporated into multiple patent applications jointly submitted and owned by the Government. The contractor is the lead inventor of these patent applications and is leader in translating these inventions into a viable technology in support of the AEC project. 7 - Description of the market survey conducted, and the results, or a statement of the reasons a market survey was not conducted: The most appropriate and informational market survey was provided by the results obtained from a posting of the procurement in the public domain (see FAR Part 10). The synopsis received no responses. 8 - Other facts supporting the use of other than full and open competition: The initial feasibility period of the AEC project has resulted in a new fundamental understanding made by the Contractor of processes critical to NASA’s mission and national security and welfare. The project is now entering a critical accelerated validation and development period, and the continuing support by the Contractor on all theoretical matters related to successfully guiding experiments and device construction is paramount for successful accomplishment of the program objectives as stated by NASA HQ and other Government agencies. 9 - Sources, if any, that expressed an interest in writing in the acquisition: No sources expressed an interest in the acquisition. 10 - The actions, if any, the agency may take to remove or overcome any barriers to competition before any subsequent acquisition for the supplies or services required: None. Due to the proprietary nature of this research, this contract and future contracts relating to it, will be synopsized and posted as a sole source until capability is shown by an outside source. ed note - The NASA PineScie contract has the following modification. THE PURPOSE OF MOD 2 IS TO UPDATE THE INVOICING CLAUSE.THEORETICAL PHYSICS SUPPORT FOR ADVANCED ENERGY CONVERSION PROJECT THE ADVANCED ENERGY CONVERSION (AEC) PROJECT AT NASA GLENN RESEARCH CENTER INVESTIGATES ADVANCED MATERIALS CONCEPTS FOR HEAT PRODUCTION IN VARIOUS MATERIALS WHEN STIMULATED USING VARIOUS INPUT PARAMETERS. IN THIS PROJECT, EXPERIMENTAL HARDWARE WILL BE DESIGNED, ASSEMBLED, FABRICATED, AND TESTED TO DETERMINE THE SOURCE AND AMOUNT OF HEAT PRODUCTION. HEAT PRODUCTION IS NECESSARY FOR LONG DURATION SPACE FLIGHTS IN WHICH SOLAR POWER IS NOT SUFFICIENT TO POWER THE MISSION REQUIREMENTS. THE AEC PROJECT IS SEEKING THEORETICAL AND COMPUTATIONAL SUPPORT FOR THE PROJECT. THIS PROCUREMENT AIMS AT CONDUCTING PERFORMANCE-BASED TASKS TO ASSIST NASA ACCORDING TO THE TASKS OUTLINED IN THE STATEMENT OF WORK BELOW. MINIMUM PERSONNEL QUALIFICATIONS: 1. PH.D. OR EQUIVALENT IN THEORETICAL PHYSICS, WITH SPECIALIZATION IN QUANTUM MECHANICS, QUANTUM FIELD THEORY, NUCLEAR PHYSICS, PLASMA PHYSICS, AND OTHER THEORETICAL FOUNDATIONS OF THE STANDARD MODEL. 2. FURTHER DEMONSTRATIVE EXPERTISE IN MODEL DEVELOPMENT OF ENERGETIC PROCESSES IN METAL SUBSTRATES, INCLUDING LATTICE SCREENING. 3. PH.D. OR EQUIVALENT IN COMPUTATIONAL/NUMERICAL PHYSICS. 4. DEMONSTRATED EXPERTISE IN HIGH LEVEL MODEL DEVELOPMENT IN AT LEAST MATHEMATICA. 5. U.S. CITIZENSHIP ALLOWING RESEARCHERS TO MEET AT NASA TO DISCUSS FINDINGS AND TO REVIEW EXPERIMENTAL HARDWARE. Acknowledgments: The authors gratefully acknowledge the assistance of many people that supported this effort. Dr. Pamela Mosier- Boss, Amy Rankin, Victoria Leist, and Emily Martin for CR-39 measurement and analysis. - Study the gamma/electron irradiation effects on deuterated metals. - Past research involved accelerated deuteron beams relative to the laboratory frame center of mass. - Focus of this study explores a stationary laboratory frame center of mass for the deuteron while increasing the electron density and energy to investigate the effect of electron screening. ed note: This patent citations include two patents “Method and apparatus for generating thermal energy” and “Methods of generating energetic particles using nanotubes and articles thereof” which have a classification: G21B3/00 Low temperature nuclear fusion reactors, e.g. alleged cold fusion reactors. *From the ed-addendum on Monday April 23: These two contracts, which came in from the folks at LENR Forum, prove the fact that LENR propulsion systems are being built at NASA GRC by members of the Advanced Energy Conversion effort. The paper being presented this June at ICCF21, by Lawrence Forsley of GEC, provides further proof. + Gustave C. Fralick, with NASA, has been active in the field of LENR since 1989. Do any of these encompass all reported observations? More than one effect may be occurring. ed side note - Lawrence has 43 papers listed at ResearchGate. It is interesting to note there are are no papers submitted by him for a ten year period, 1992 through 2002. During this time Lawrence collaborated with James Patterson, and purchased a RIFEX kit/research license... Jim was a pioneer claiming the transmutation of actinides to benign elements in a LENR process. These claims are similar to claims made by GEC. I developed a working relationship with Jim Patterson and his company, Clean Energy Technology Inc., in the mid-1990s, before the development of the company’s cold fusion demonstration kit called RIFEX (Reaction In a Film Excited complex). Eventually, we licensed a specific technology and, with one of my electrochemist colleagues, began doing experiments in my friend’s laboratory, at my lab in Annandale, Va., and in Jim Patterson’s “garage laboratory,” in Sarasota, Fla. I set out a goal for Jim, which he carried out and was even granted the patent on. I chose to not get involved with the patent application, because I didn’t believe his instrumentation reflected what the patent asserted. Jim and I continued to kibitz for a couple of years. At ICCF-7 in Vancouver, B.C., in 1997, I presented data from my experiments in which I had used Jim’s beads. However, before that conference, Jim and I had a meeting in Washington, D.C., coinciding with an American Nuclear Society meeting. I had concluded, as I would state in my ICCF-7 talk, that I had seen no evidence of LENR-induced isotopic shifts from an analysis of gases, solids or electrolyte using nuclear activation analysis (NAA), high resolution inductively coupled plasma mass spectroscopy (ICP/MS) or x-ray fluorescence (XRF). Jim was quite irate when I said this. “I didn’t pay you to get those kind of results!” he said. ed note - Also at ResearchGate, Mr. Forsley has the following archived project. A list of project papers and 211 referenced papers is found at the project archive. A full review of these items is worthwhile. ed note - Bruce Steinetz is in the Structures and Materials Division; specializing in seals for turbojets and space applications. ed note - Theresa Benyo is in the Structures and Materials Division; participating in MHD engine design. This paper describes the preliminary results of a thermodynamic cycle analysis of a supersonic turbojet engine with a magnetohydrodynamic (MHD) energy bypass system that explores a wide range of MHD enthalpy extraction parameters. Through the analysis described here, it is shown that applying a magnetic field to a flow path in the Mach 2.0 to 3.5 range can increase the specific thrust of the turbojet engine up to as much as 420 N/(kg/s) provided that the magnitude of the magnetic field is in the range of 1-5 Tesla. The MHD energy bypass can also increase the operating Mach number range for a supersonic turbojet engine into the hypersonic flight regime. In this case, the Mach number range is shown to be extended to Mach 7.0.
ed note - Arnon Chait works on Electrostatic Research at GRC aiming to mitigate Martian dust, also listed as Senior Scientist at GRC AEC. ed note - Robert Hendricks specializes in turbo machinery and their seals. ed note - Nicholas Penney specializes in shape memory alloy for turbo machinery and seals. ed note - It seems the folks at Vantage are mainly engineers... Applied engineering of new technologies is what they do. + Annette M. Marsolais, Vantage Partners LLC. As a fully trained user she is permitted independent access to the lab which has this equipment. The Swagelok Center for Surface Analysis of Materials is one of Case Western Reserve University’s largest core facilities, providing a variety of instrumentation for the microstructural and compositional characterization of materials as well as surface and near-surface chemical analysis. The Center’s equipment is complemented by a staff of professionals who are available to assist and train academic, research, and commercial users. + Tracy Kamm, and Dave Hervol are thanked in the ‘Acknowledgments’ for database and record support. ed note: Michael is an engineer who specializes in mechanical system test and analysis. His experience gives the GRC/PineScie/VantagePartners LENR research team intimate access to the world’s largest space environment simulation chamber. The Cyroshroud at the Plum Brook Space Power Facility (SPF) test chamber. On a side - ed note: Vantage Partners participates in NEAT at NASA Plum Brook Station. Perhaps useful for the NASA SUGAR - LENR Phase lll program or the NASA GRC AEC LENR energy end goal. Quote: Some of the key propulsion system advances the NASA Glenn team is pursuing converge in an aircraft concept study called STARC-ABL (single-aisle turboelectric aircraft with an aft [at the rear of the aircraft] boundary-layer propulsor). ed note: James Felder also conceptualizes LENR powered flight in the NASA SUGAR program. Pg. 24 -Even though we do not know the specific cost of the LENR itself, we assumed a cost of jet fuel at $4/gallon and weight based aircraft cost. We were able to calculate cost per mile for the LENR equipped aircraft compared to a conventional aircraft (Figure 3.2). Looking at the plots, one could select a point where the projected cost per mile is 33% less than a conventionally powered aircraft (Heat engine > 1 HP/lb & LENR > 3.5 HP/lb). ed note: I posit that NEAT at NASA Glenn Research Center is where we will see the SUGAR Volt concept and LENR energy coming together in a Hybrid LENR/Turbo Electric Aircraft powertrain configuration. This patented Boeing LENR turbine is a likely candidate for such a hybrid propulsion system. ed note: Take notice of the co-sponsor of this competition. Quote- Leidos, a spin-off of Science Applications International Corporation (SAIC), is an American defense company headquartered in Reston, Virginia, that provides scientific, engineering, systems integration, and technical services. Leidos works extensively with the United States Department of Defense (4th largest DoD contractor FY2012), the United States Department of Homeland Security, and the United States Intelligence Community, including the NSA, as well as other U.S. government civil agencies and selected commercial markets. Michael J. Ravnitzky - Michael J. Ravnitzky is the developmental editor of the Explorations in Nuclear Research three-book series, Hacking the Atom, Fusion Fiasco and Lost History, published in 2016. Steven B. Krivit is the author of the Explorations in Nuclear Research three-book series, Hacking the Atom, Fusion Fiasco and Lost History, published in 2016. He was an editor for the American Chemical Society 2008 and 2009 technical reference books on LENR and editor-in-chief for the 2011 Wiley Nuclear Energy Encyclopedia.